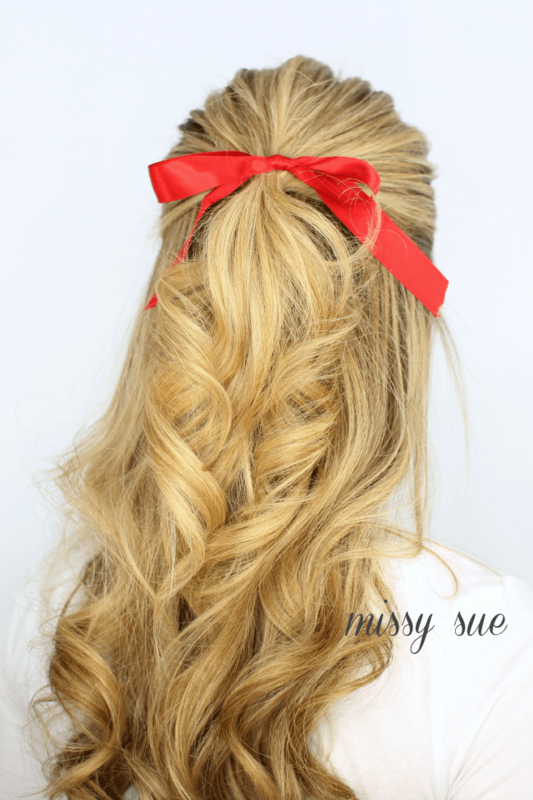 Valentine’s Day is coming up and what better hairstyle is there than one with a pretty red ribbon. 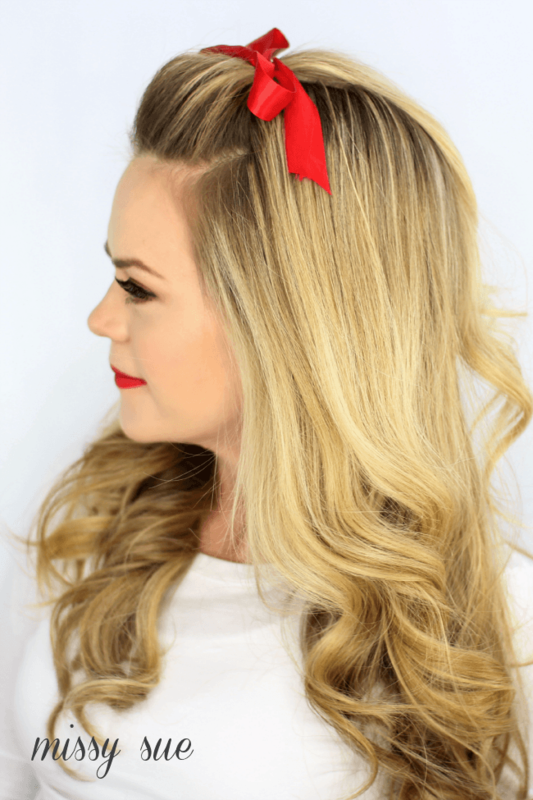 This tutorial features not one but three different ways to wear your half up and each one is topped off with a cute, red bow. 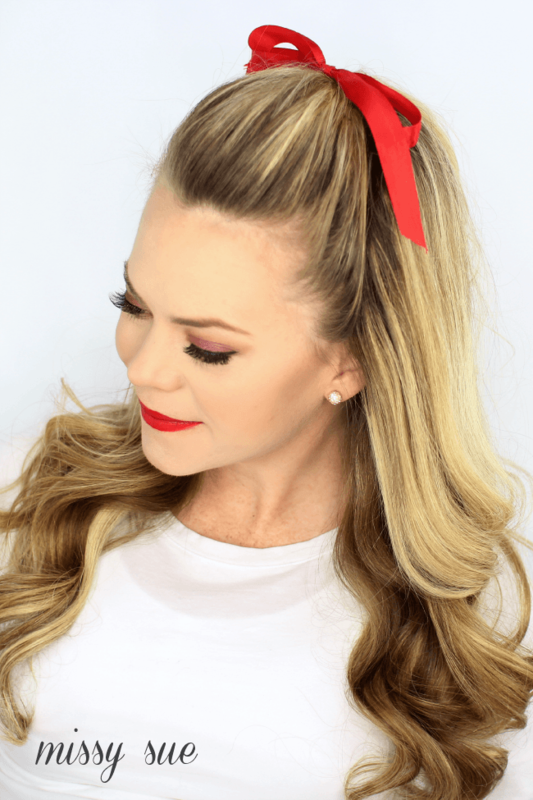 I am a huge fan of red ribbons, as seen from this post, and think it’s an easy way to dress up your style in a matter of seconds. Let’s get on to the tutorial! 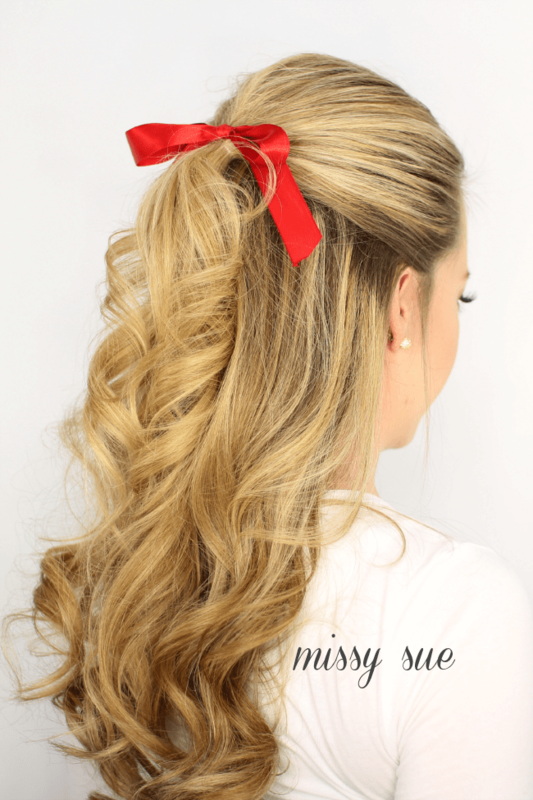 How are you planning to wear your hair this Valentines? Step 1 / Separate off a portion of hair from the top of the ears to the back of the head, clipping off the top portion. Step 2 / Spray the hair with a heat protectant spray; I am using one from Tresemme. 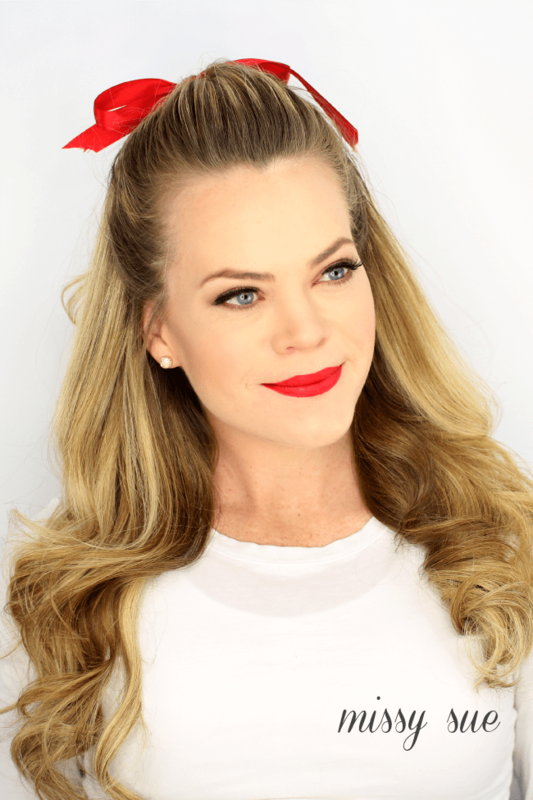 Step 3 / Pick up a 1″ section of hair and curl the strand away from the face using a 1″ curling iron; mine is from Hot Tools. Step 4 / Continue curling the hair in sections, bringing down one layer at a time, until all the hair is curled. Step 5 / For the first style, separate a section of hair, at the corners of the forehead, and bring it up and back towards the crown. Step 6 / Gently back comb this section of hair to create a little volume. Then carefully comb down and smooth the top layer to hide the teased portion. Step 7 / Then tie it off with a clear elastic band. Pinning it down with hair pins is easier but since I am wearing a ribbon, I chose to use an elastic since it makes tying a ribbon over the top a little easier. Step 8 / Now tie a ribbon around the elastic band for the last step of Look #1. Step 9 / For Look #2, separate a portion of hair from the top of the ears, up towards the crown, and tie it off with an elastic. Step 10 / Smooth down any loose hairs and tie your ribbon around the elastic to complete the second version. Step 11 / For Look #3, create some volume at the back of the crown by gently back combing the hair. Step 12 / Smooth out the top layer of hair and then brush all the hair towards the back of the head. Step 13 / Separate off a section of hair from the top of the ears and bring it straight back towards the back of the head. Step 14 / Tie off the top section with a clear elastic and smooth down any loose hairs with some hairspray. Step 15 / Then finish the look by tying a red ribbon around the elastic.